Over the last few months I (Hugh) have been contemplating wrestling with the question: What is a Bible? This is not an unreasonable question. One of the organizations I am affiliated with is Wycliffe Bible Translators. Over these months I have also had some interesting conversations about what a Bible Translator is. However, I think that a further discussion of what a Bible Translator is warrants its own post (soonish). And I want to ask here: What is a Bible? When I was in first grade some of the first books I had were DoveTales (now compiled in a single binding). They were packages of two stories which came in the mail every other week with a cassette tape. I remember being so excited to check the mail every time the mailman came. I would open the books look at the pictures and read the big print while listening to the tapes. Reading for me was still hard as I was just learning, but these books had simple sentences and audio to match the text. In fact I still have some of those books some 25 years later. Were those DoveTales, the Bible? If we say that Bible translators translate the Bible and they produced something like that, would that count as a Bible? However, it was full of dialogue straight from the Bible and fascinating imagery. It helped me to have a better idea of the participants in stories and an overall better memory of the stories. But was that a Bible? 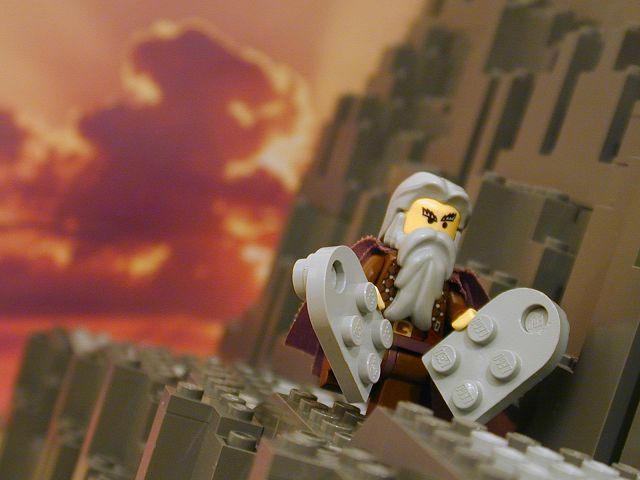 A scene from the Brick Bible. What about the Brick Bible is that a Bible? Or what about the FreeIllustrated Bible is that a Bible? 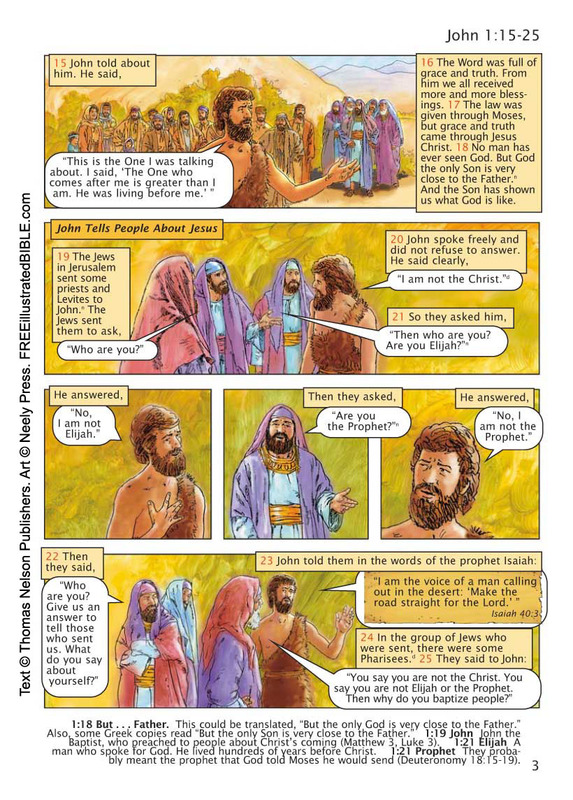 John 1 from the Free Illustrated Bible. In these illustrated Bibles, do facial expressions give more context (or a different context) to the dialogue than when reading the words off of a page without visual stimulus? What is the effect or significance of visual stimulus on translation? Was there visual stimulus originally between the characters in the narratives? Did that affect understanding of what the communication was between the characters in the Bible? Now take the Bible in signed languages. Signed languages have “words” but the “words” are not spoken. The words are hand shapes, facial expressions and motions of appendages which carry meaning, much in the same way that sound frequencies carry meaning for users of oral languages. However, these meanings in signed languages are not always (if ever) the same as in spoken languages. For example, I mean that the sign for house in American Sign Language (ASL) is similar to the word for house in American English but their similarity is in that they both refer to the same concept, not that the ASL sign is another way of spelling the American English word house, even though ASL can also finger spell the spoken English word. Many deaf people think in terms of signs, not in terms of sequences of sounds (even if they are represented by letters on a page). So, what is a Bible to them? Is it a collection of words or is it a collection of signs which convey a specific meaning? How are those signs to be presented to those deaf people? Should they be presented as 2-D images in a book? or as 3-D animations in a video format? Is either of those a Bible? What if the narrative (stories) sections of the Bible were dramatized with different voices so that people understood who was saying what more easily? Is that a Bible? There are 12 languages spoken in my diocese. I would like the people in my diocese to learn to read and to be able to read the Bible. But in order for me to get the blessing of my superiors the apocrypha must be included in the translation project. In this diocese, current literacy rates are 0% for both men and women in their first language (which is the language that the Bible is to be translated into). Literacy rates in their second language are 20% among men and 10% among women. Both translation and literacy are going to be a challenge, but the challenge will provide opportunity to demonstrate Christ’s love and the translators’ humanity during the process of translation. Through the process of translation the participants will gain a deeper knowledge of the events and the characters in the texts. Would the translation produced through this effort be a Bible? Even if it were not a Bible would the creation process be something which God could work through to bring people to a deeper understanding of who He is? 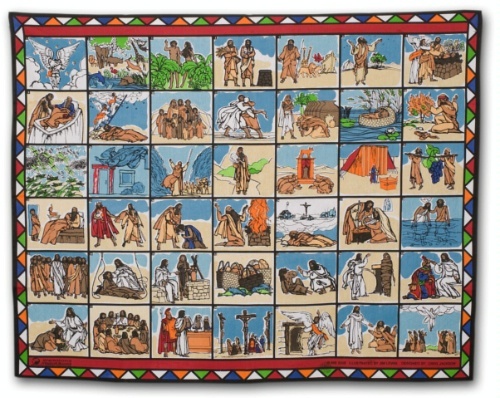 Bible Stories Scarf from IMB. If the Bible does not need to be in written form can it be in the form of a story guided by a cloth with images? I ask these questions, not to make us doubt that Christ’s death and resurrection spanned the gap between God and man, but rather to challenge Christians who are used to engaging with the Bible in only one manner or one mode. Sometimes, we don’t realize the full range of media options available in many cultures. When we think of Bible Translation, we shouldn’t limit our understanding of what that translation looks like based on our cultural experience. Each translation is not just a collection of words on a page, but it is the way it got there too. The Christian Jesus is not leather bound.